As most of us keep a deep planning on our daily income and expenditure, it is very important to get great advices from an external force who/which can bring changes in the finance management. Even though, a number of books, online articles are available, it would be good to have a companion which makes us think and shed light to our future. 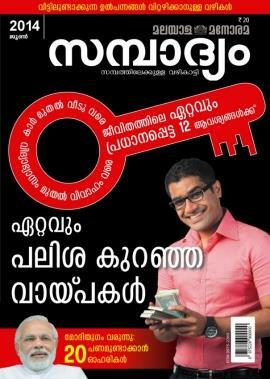 'Sampadyam' magazine published by Malayala Manorama can fit the bill giving innovative thoughts regarding personal finance management. With a core team of energetic youngsters specialized in various fields related to money and investment works behind the screen delivering the best to the readers. 'Sampadyam' has already become a household name among the family who care much about their future. Credited to be one of the most popular periodical featuring articles on Investments and financial planning, this personal investment magazine covers news bits on stocks, mutual funds, insurance, and Income Tax. More than a magazine, 'Sampadyam' serves and an advisor and companion while taking decision on investment. The highlight of this magazine would be the exclusive articles and practical guidance on saving, investing, planning for retirement, buying automobiles, homes and other major purchases. Readers can also get tips and tricks on managing money and achieving financial security from experts. Special features on how to save money and budget your personal finances makes this magazine favourite among the reading community. The attractive presentation style and simple language keep the readers engaging till the last page. With only few malayalam magazines focusing on the niche segment, 'Sampadyam' can be close companion for everyone who wish to create and manage wealth. Initially published as a quarterly, this magazine was revamped and become a monthly from October 2010 issue. Write ups from celebrated personalities and experienced hands add much colour to the popularity to the magazine. Executives, entrepreneurs and high net worth investors recommend 'Sampadyam' to their friends and relatives as it's engaging and packed with inspiring content. So if you wish to keep updated about the happening in the commerce industry, be a regular reader of 'Sampadyam'.